A North Carolina-based Formula 1 racing shop needed to alleviate dust in the work area in order to keep employees safe and keep their state of the art facilities clean. The customer needed a solution for source capture of heavy tooling board and foam dust from two five-axis routers. The multi-directional movement of the tool heads made this extremely challenging capture the fine particulates. Air Purification Inc. provided a no-cost, no-obligation site survey to determine the proper solution including turn-key service by API factory-trained staff. 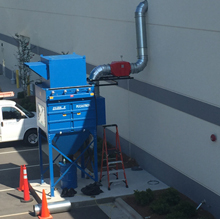 An outside mounted heavy-duty cartridge collector with an external back blast damper was installed. The unit, a Filter-1 Pulsatron, features an abrasive inlet plenum for flexible ducting to the router head. Inside, a source capture hood with mounted flexible duct travels with the machine head as it moves. The system was able to collect 99% of the particulate from the routers. The customer was very satisfied with the results and plans to expand on the system in the future.